Hellens Group obtained planning consent for a mixed use development in 2010 situated at Teal Farm in Washington, including consent for A1/A2/A5 retail units. The Village Centre is part of a major 60 acre mixed use development which in addition to the retail units, it also benefits from planning for over 600 houses, landscaped open space and play areas and a public house /restaurant. Teal Farm Village Centre itself comprises over 7,800 sq ft of retail space. Construction works commenced on the development in late 2012 and were completed in summer 2013. Given the proximity to executive housing, in depth consideration was required to ensure the building was in-fiƫng with its surroundings. The scheme comprised of four retail units benefiƫng from A1/A2/A5 consent. The four units were a variety of sizes, with the largest unit having a convenience operator as its primary target as a tenant with an overall floor space of 4600 sq ft. In addition to the larger unit, three further units varying from 1000 sq ft up to 1285 sq ft.
An anchor tenant was secured for the largest unit (4600 sq ft), being pre-let to Sainsbury’s Supermarkets Limited prior to the completion of the development. 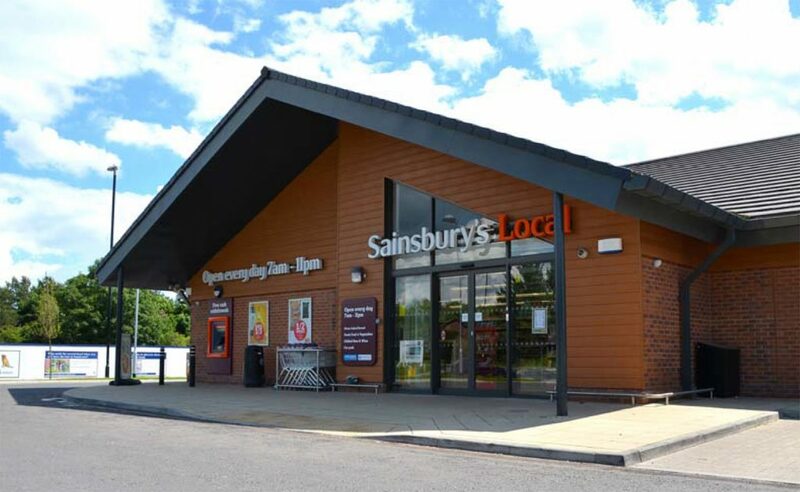 Following on from Sainsbury’s occupying the largest unit, operating as a Sainsbury’s Local, leases were secured on the remaining three units within less than a year of the completion of the development.